A “weedy” orchid, common along the roadsides and fields of middle elevations in Central America, the Spanish Flag Orchid is rather eye-catching and distinct. This terrestrial orchid is recognized by its bold inflorescences of fiery reds, oranges and yellows, situated atop a long, cane-like stem up to a meter in length. Leaves are oval, fleshy and are placed regularly along the stem. The stem is covered in imbricated sheaths, as well as the base of the inflorescence. Inflorescences can contain 20-30 flowers, and can be up to 50 cm long. Flowers have a three-lobed lip, which are fringed, and fringes may be lighter in color, fading to yellow. The column and the lip are fused together. Seeds are very small. 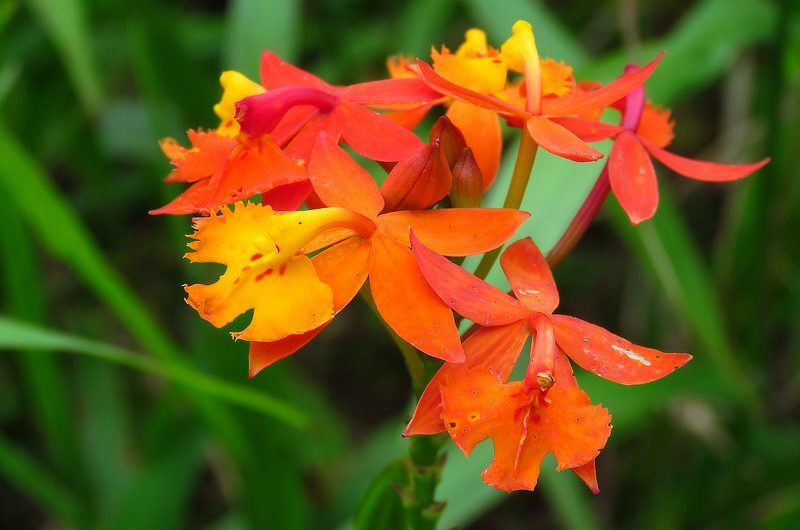 Several key characteristics distinguish this species from other similar Epidendrum species and other flowering plants in the ecological complex to which it belongs. It produces adventitious roots (secondary roots) that grow off the stems and are used to absorb nutrients and support the plant on different surfaces, including other plants! Its flowers bend backwards and face upwards (resupinate), unlike other Epidendrum species. Its stems do not swell to form pseudobulbs, and it does not produce nectar in the flowers. E. radicans is placed in a complex with several other orange-flowered species that are ecologically similar but otherwise unrelated, including Asclepias curassavicia (Tropical Milkweed) and Lantana camara. These species all share the same habitat and pollinators, and are a great example of convergent evolution. A hypothesis exists that E. radicans mimics the two aforementioned species for pollination, since E. radicans does not produce nectar and the other two do; however, this hypothesis is not supported (Bierzychudek 1981). This orchid is pollinated by butterflies. The Spanish Flag Orchid ranges from southern Mexico throughout Central America and into Colombia. It is cultivated as an ornamental in some parts of Africa, Asia and Australia. It has a vigorous nature just about everywhere it grows, and especially prefers disturbed sites where it is cultivated. It can even grow in rather challenging locations, including between lava rocks! Many names: The Spanish Flag Orchid is also known as the ground-rooting orchid, fire star orchid, rainbow orchid and reed-stem orchid, among other common names.